Hardcover - 336 Pages 6-1/8" x 9-1/4"
As winter deepens over the Blue Ridge Mountains, even the threat of snowstorms cannot derail this year’s Christmas run, not as long as Sister Jane has a say in it. With spirits high and traditions strong, a glorious parade of hunters in full holiday regalia gathers on the grounds of Tattenhall Station. But a blinding blizzard brings an early end to the sport. More disturbing: A horse soon returns without its rider. Gregory Luckham, the president of a powerful energy company pushing for a pipeline through central Virginia, is the missing hunter. His presence on the hunt has been controversial to say the least, and few would bemoan his passing. A search is organized for what is presumed will be a dead, frozen body. What is discovered, however, chills everyone to the bone—and points toward murder. With more than a few opinions offered by hunters, horses, hounds, and foxes, Sister Jane sets out to track down a killer and untangle a mystery packed as hard as snow—full of secrets, old wounds, and avarice. 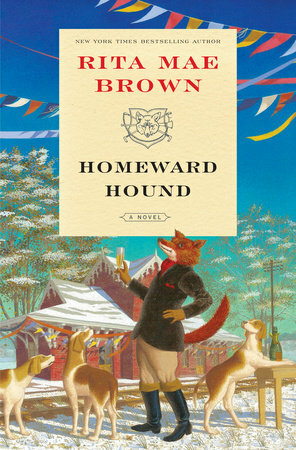 Steeped in the local history of Virginia’s horse country, Homeward Hound is a delightful immersion into a storied world no one knows better than Rita Mae Brown, accompanied by the indelible animal characters she brings vividly to life.